In this lesson, we will learn how to identify the scale factor of a dilation of a figure and recognize when a dilation is part of a combination of transformations. A quadrilateral 𝑄 has been dilated by a scale factor of 2 to 𝑄 ′ . Are 𝑄 and 𝑄 ′ congruent? What is the name of the transformation that changes the size of a given figure by a particular scale factor? Consider two circles with different radii. One of the circles can be translated so that they are concentric. Which of the following transformations could be used to transform the radius of one circle to the other? In the given figure, what is the scale factor between circle 𝐴 and circle 𝐵 ? Triangle 𝐴 𝐵 𝐶 has been dilated from point 𝐷 to triangle 𝐴 𝐵 𝐶 ′ ′ ′ and, hence, the two triangles must be similar. What is the scale factor of the dilation? Triangle 𝐴 𝐵 𝐶 , in the given figure, has been dilated from the point 𝐺 and then reflected to form triangle 𝐷 𝐸 𝐹 . State the scale factor of the enlargement. State the line of reflection. The perimeter of a piece of land in the shape of an equilateral triangle is 720 m. When a scale drawing is made, the length of side of the triangle is 2 cm. What is the drawing scale? The image of triangle 𝐴 𝐵 𝐶 after a dilation from point 𝐷 by a scale factor of four is a triangle 𝐴 ′ 𝐵 ′ 𝐶 ′ . Which of the following statements is true of triangles 𝐴 𝐵 𝐶 and 𝐴 ′ 𝐵 ′ 𝐶 ′ ? A The sides of 𝐴 ′ 𝐵 ′ 𝐶 ′ are four times longer than the corresponding sides of triangle 𝐴 𝐵 𝐶 . B The two triangles have equal areas. C The two triangles have equal perimeters. D The orientations of the two triangles are different. E The vertices 𝐴 and 𝐴 ′ are in the same position. The image after dilating triangle 𝐴 𝐵 𝐶 from point 𝐷 , by a scale factor of three, is triangle 𝐴 ′ 𝐵 ′ 𝐶 ′ . Which of the following statements is true of triangles 𝐴 𝐵 𝐶 and 𝐴 ′ 𝐵 ′ 𝐶 ′ ? AThe angles in the two triangles are equal. BThe two triangles have equal areas. CThe two triangles have equal perimeters. DThe orientations of the two triangles are different. EThe vertices 𝐴 and 𝐴 ′ are in the same position. The triangle 𝐴 𝐵 𝐶 has been transformed to triangle 𝐴 𝐵 𝐶    which has then been transformed to triangle 𝐴 𝐵 𝐶       . Describe the single transformation that maps 𝐴 𝐵 𝐶 to 𝐴 ′ 𝐵 ′ 𝐶 ′ . Describe the single transformation that maps 𝐴 ′ 𝐵 ′ 𝐶 ′ to 𝐴 ′ ′ 𝐵 ′ ′ 𝐶 ′ ′ . Hence, are triangles 𝐴 𝐵 𝐶 and 𝐴 ′ ′ 𝐵 ′ ′ 𝐶 ′ ′ similar? Dilate triangle 𝐴 𝐵 𝐶 from the origin by a scale factor of − 2 , and state the coordinates of the image. A triangle with a perimeter of 16 has been dilated by a scale factor of 1 2 . What is the perimeter of the image? Triangle can be dilated from point by a scale factor of 2 to the triangle . What is true of the sizes of the angles in both triangles? BThe sizes of the angles in both triangles depend on their lengths. CThe sizes of the angles in triangle are double the sizes of the angles in triangle . EThe sizes of the angles in triangle are half the sizes of the angles in triangle . If the points 𝐽 ( 4 , 6 ) , 𝐾 ( 8 , 7 ) , and 𝐿 ( 8 , 2 ) form a triangle, determine the images of its vertices after a dilation with a scale factor of 2 3 . In the given figure, the square 𝐴 𝐵 𝐶 𝐷 has been dilated by a scale factor of two to the square 𝐴 𝐵 𝐶 𝐷     , and the length of 𝐴 𝐵 is 4. Work out the perimeter of 𝐴 ′ 𝐵 ′ 𝐶 ′ 𝐷 ′ ? Work out the area of 𝐴 ′ 𝐵 ′ 𝐶 ′ 𝐷 ′ ? An architect made a model for a building that is to be 154 metres tall. 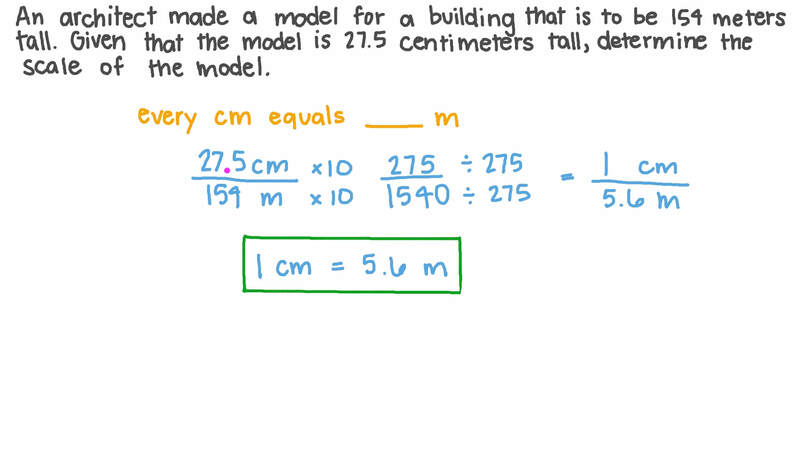 Given that the model is 27.5 centimetres tall, determine the scale of the model. On a certain map, 1 inch represents 7 feet. Farida believes the scale factor of the map to be , and Dalia believes it to be . Who is correct? A graphic designer wants to enlarge a design by a scale factor of 4.5. Given that the original design was 48 inches wide and 27 inches long, determine the dimensions of the enlarged version. Two locations are 6 3 4 inches apart on a map. If the actual distance between the two locations is 278 miles, which of the following is the map’s scale? Given that the scale of the following blueprint for a swimming pool is 1 4 in. for every 2 ft and that each square has a side length of 1 4 in, what are the actual dimensions of the pool? If you dilate a line by a given scale factor from a point not on the line, which property would be true of the line and its image? A The lines would be parallel. B The lines would be intersecting. C The lines would be perpendicular. D The lines would be coincident. E The lines would be skew. Shady is drawing a portrait to a scale of . If the actual dimensions of the portrait are , find the dimensions of the scaled drawing. Two models are built for the same object. The first model is built on a 1 4 0 : scale, and the second model is built on a 1 5 1 : scale. Which is the larger model? An architect made a 5-feet-tall scale model of a building. Given that the actual height of the building is 57 feet6 inches, how many times as tall as the actual building is the model?